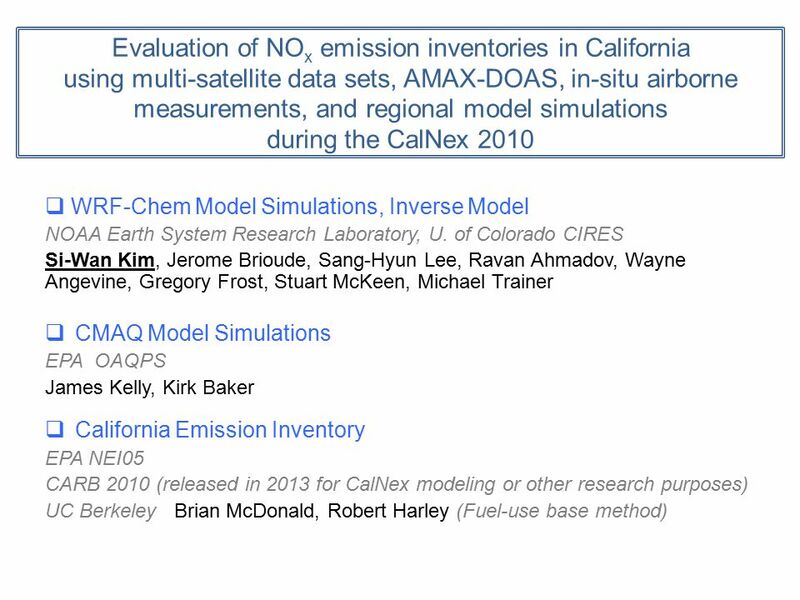 Evaluation of NOx emission inventories in California using multi-satellite data sets, AMAX-DOAS, in-situ airborne measurements, and regional model simulations. 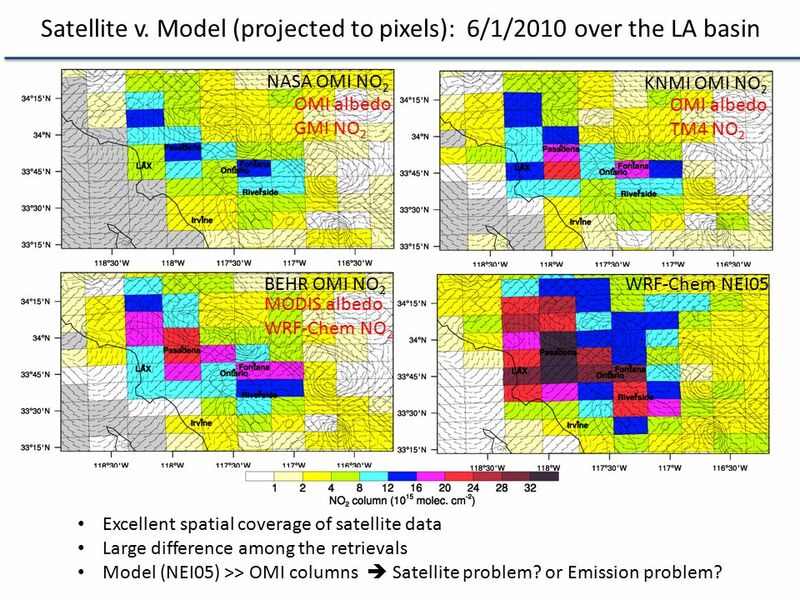 NASA OMI NO2 KNMI OMI NO2 OMI albedo GMI NO2 OMI albedo TM4 NO2 BEHR OMI NO2 WRF-Chem NEI05 MODIS albedo WRF-Chem NO2 Excellent spatial coverage of satellite data Large difference among the retrievals Model (NEI05) >> OMI columns  Satellite problem? or Emission problem? 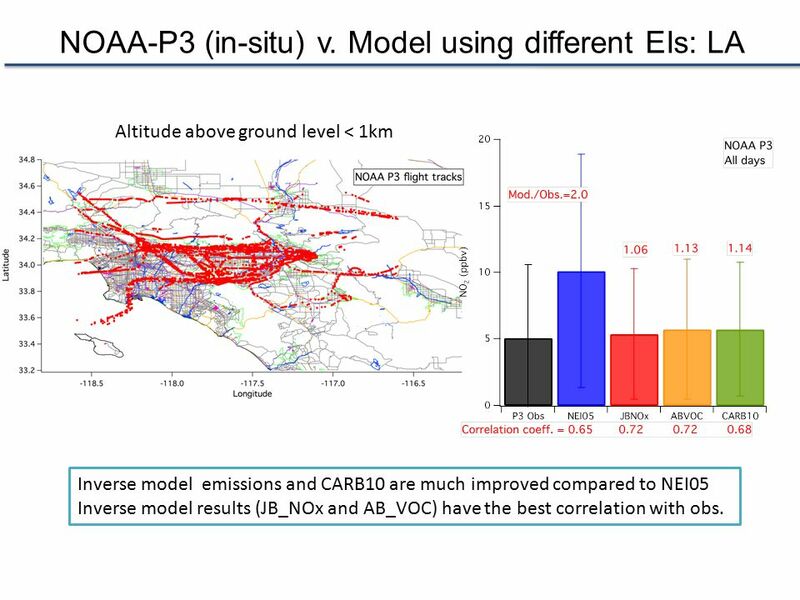 Altitude above ground level < 1km Inverse model emissions and CARB10 are much improved compared to NEI05 Inverse model results (JB_NOx and AB_VOC) have the best correlation with obs. 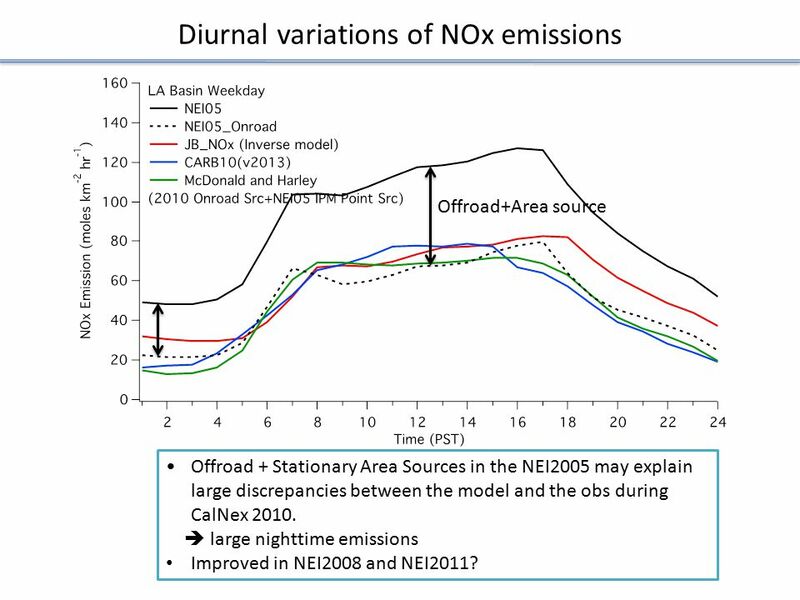 Offroad+Area source Offroad + Stationary Area Sources in the NEI2005 may explain large discrepancies between the model and the obs during CalNex 2010. 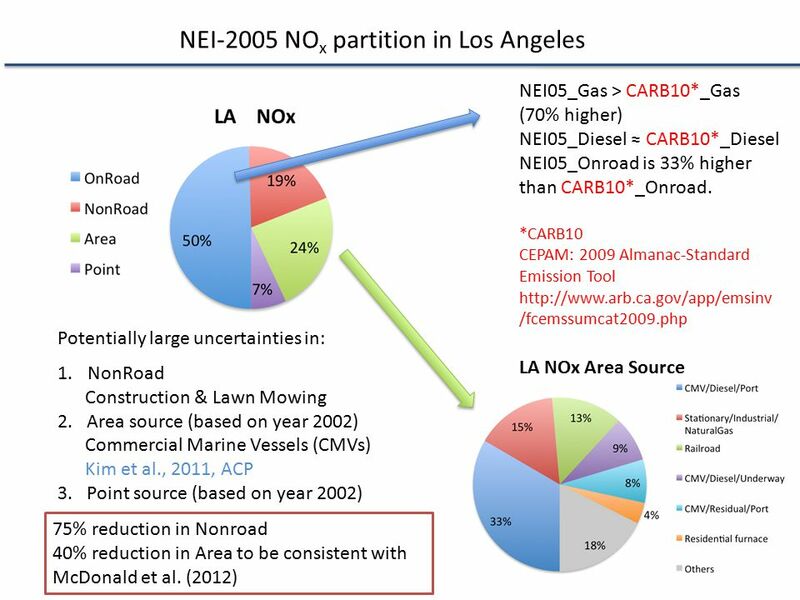  large nighttime emissions Improved in NEI2008 and NEI2011? Average of 3 OMI retrievals Correlation between the model and OMI columns is high ( ). 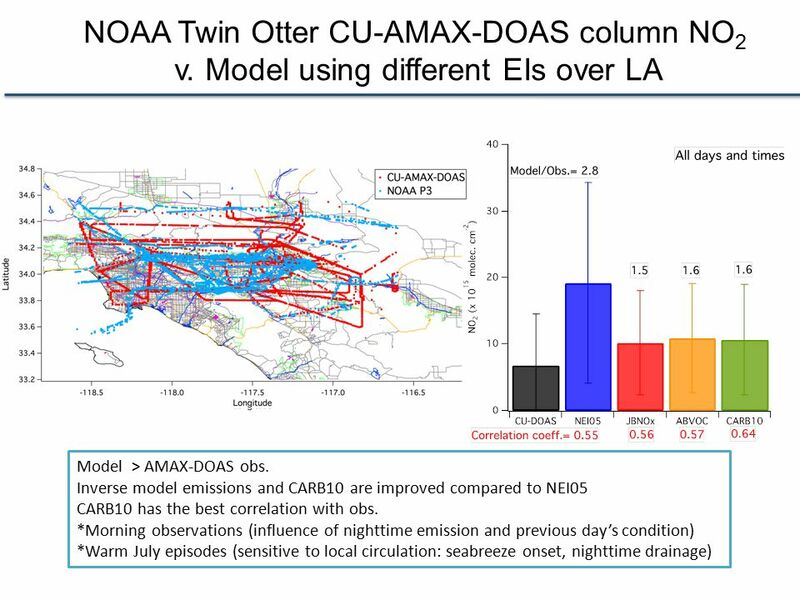 OMI retrievals are variable (UCB/NASA=1.6). 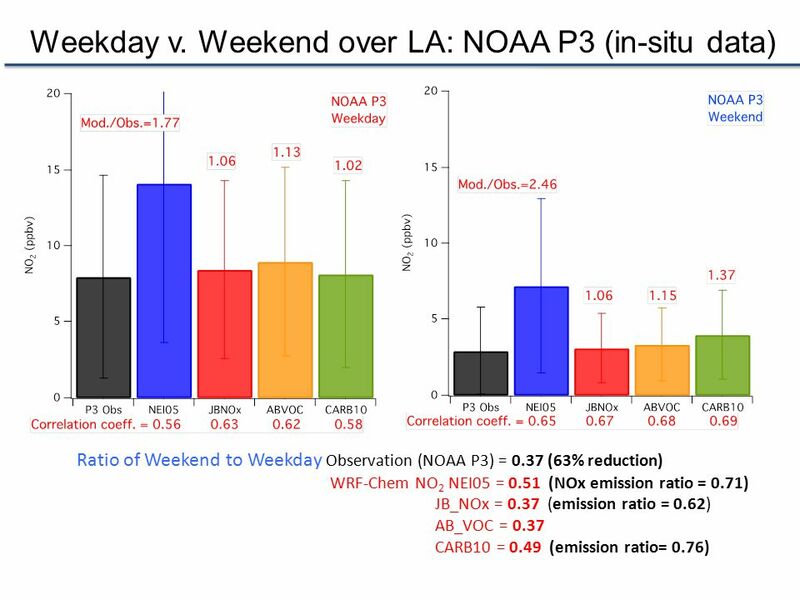 CARB10 and inverse model results are improved compared to NEI05. NASA retrieval is being recalculated with the WRF-Chem 4km x 4km NO2 profile. 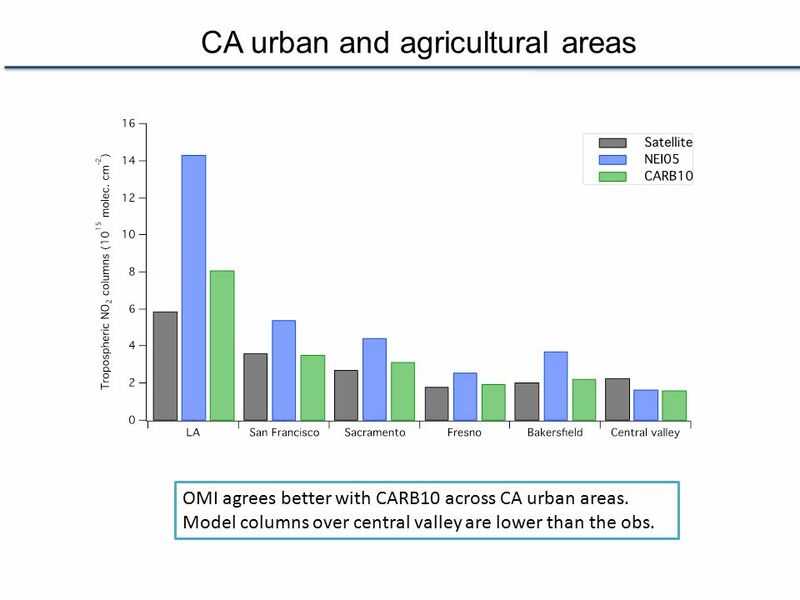 OMI agrees better with CARB10 across CA urban areas. Model columns over central valley are lower than the obs. 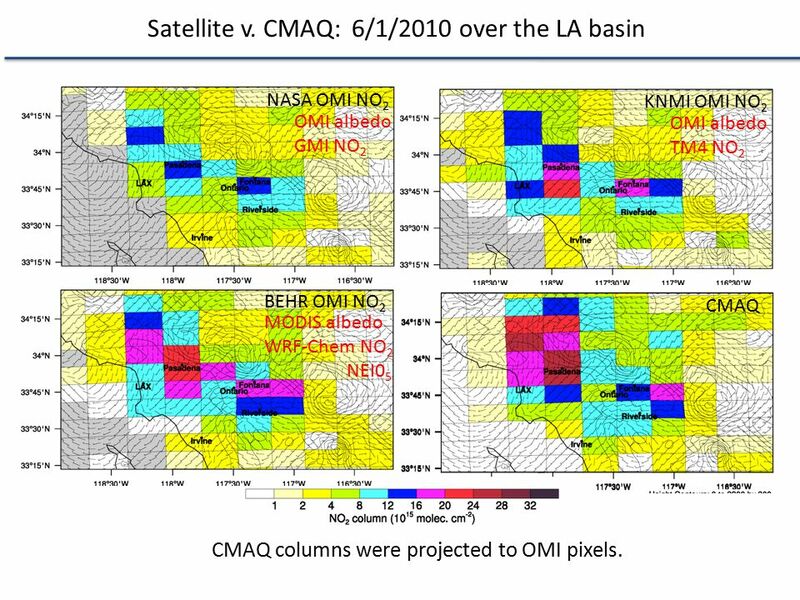 NASA OMI NO2 KNMI OMI NO2 OMI albedo GMI NO2 OMI albedo TM4 NO2 BEHR OMI NO2 CMAQ MODIS albedo WRF-Chem NO2 NEI05 CMAQ columns were projected to OMI pixels. 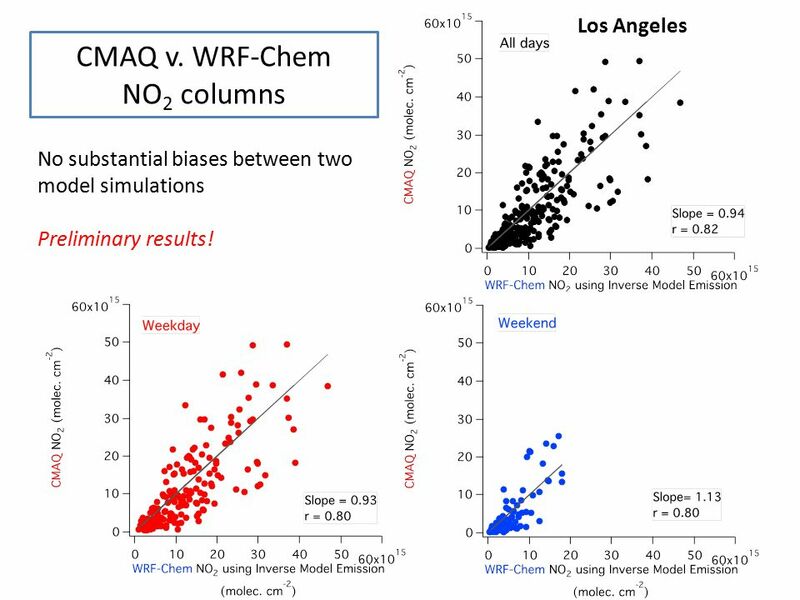 Los Angeles CMAQ v. WRF-Chem NO2 columns No substantial biases between two model simulations Preliminary results! 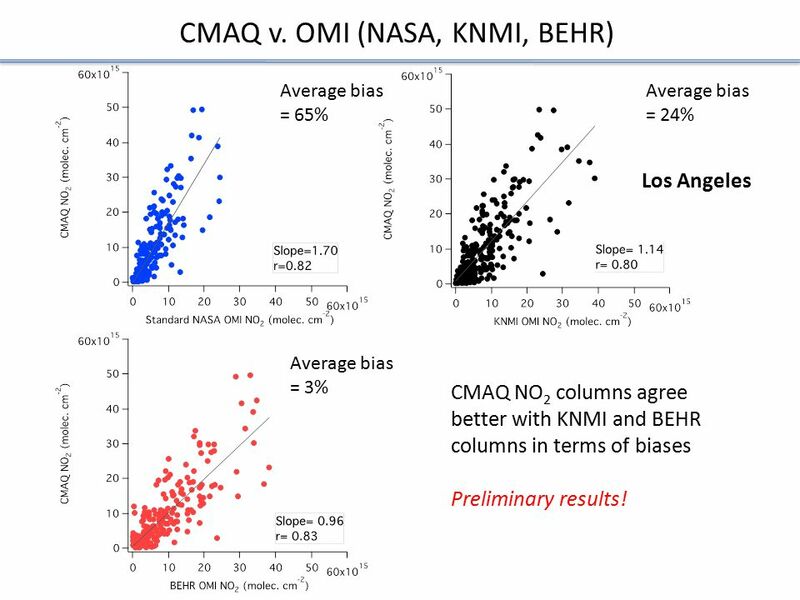 Average bias = 65% Average bias = 24% Los Angeles Average bias = 3% CMAQ NO2 columns agree better with KNMI and BEHR columns in terms of biases Preliminary results! 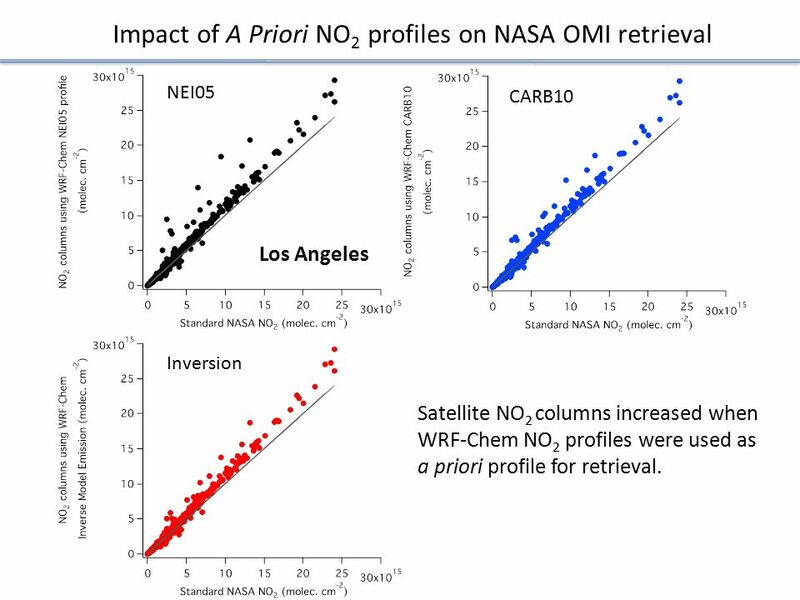 NEI05 CARB10 Los Angeles Inversion Satellite NO2 columns increased when WRF-Chem NO2 profiles were used as a priori profile for retrieval. 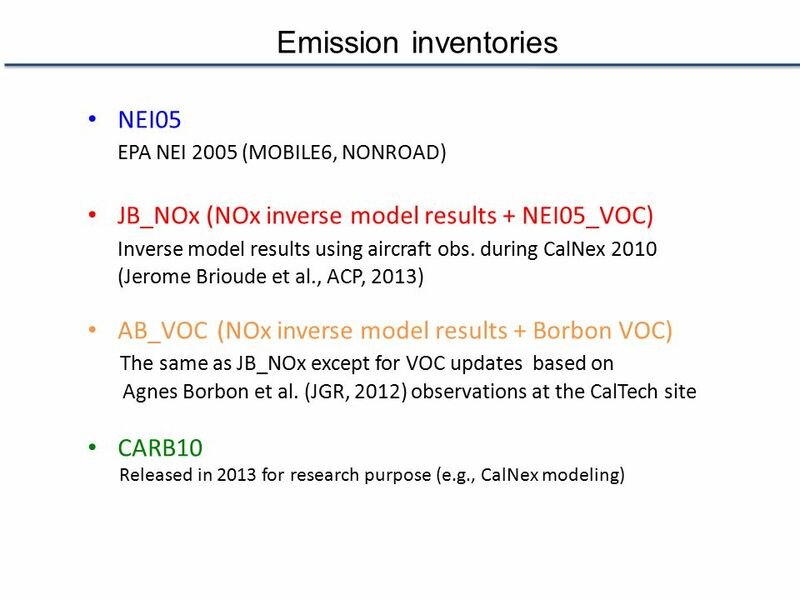 Uncertainties in California NOX emission inventories - NOx (and CO) in CARB10 is improved compared to NEI05 (correlation , bias ). - Inversion results are promising (correlation , bias ). 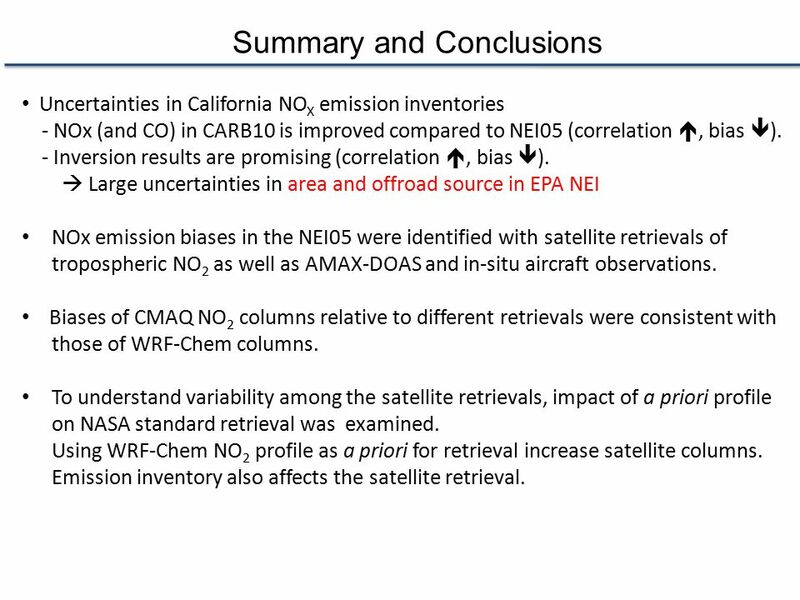  Large uncertainties in area and offroad source in EPA NEI NOx emission biases in the NEI05 were identified with satellite retrievals of tropospheric NO2 as well as AMAX-DOAS and in-situ aircraft observations. 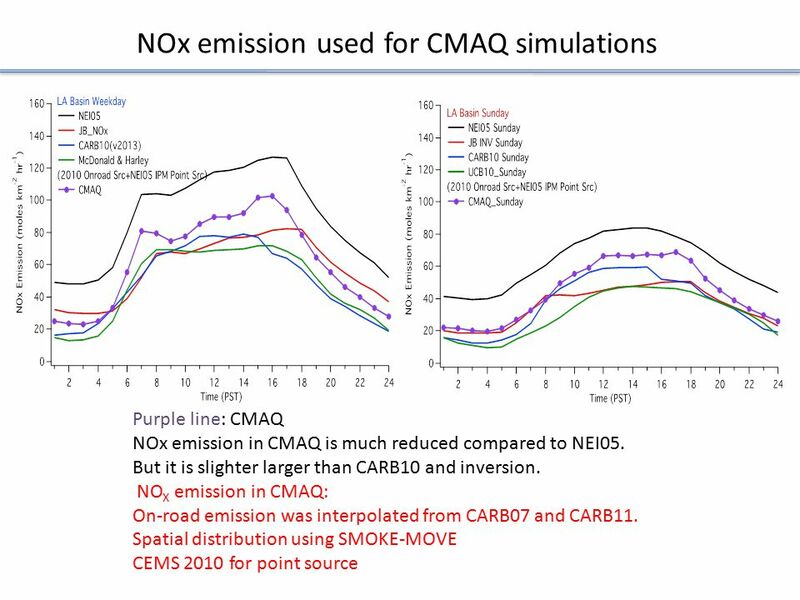 Biases of CMAQ NO2 columns relative to different retrievals were consistent with those of WRF-Chem columns. To understand variability among the satellite retrievals, impact of a priori profile on NASA standard retrieval was examined. 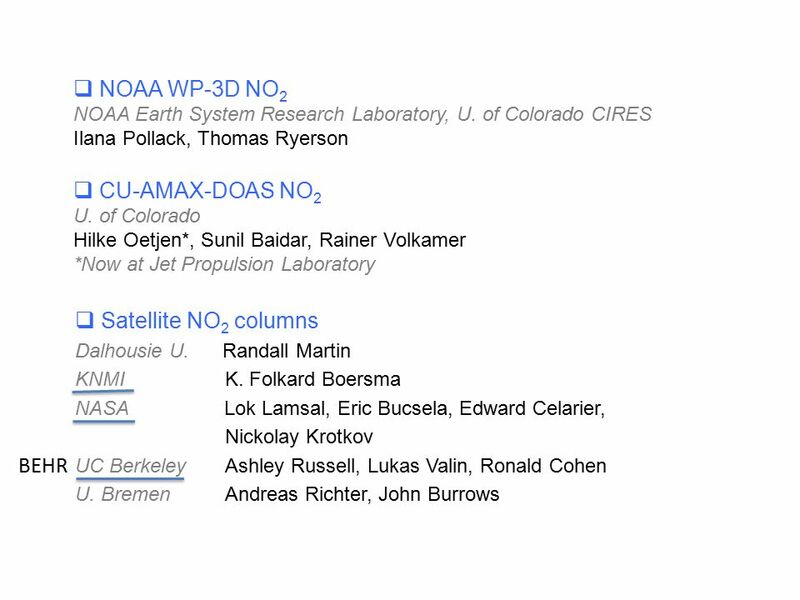 Using WRF-Chem NO2 profile as a priori for retrieval increase satellite columns. 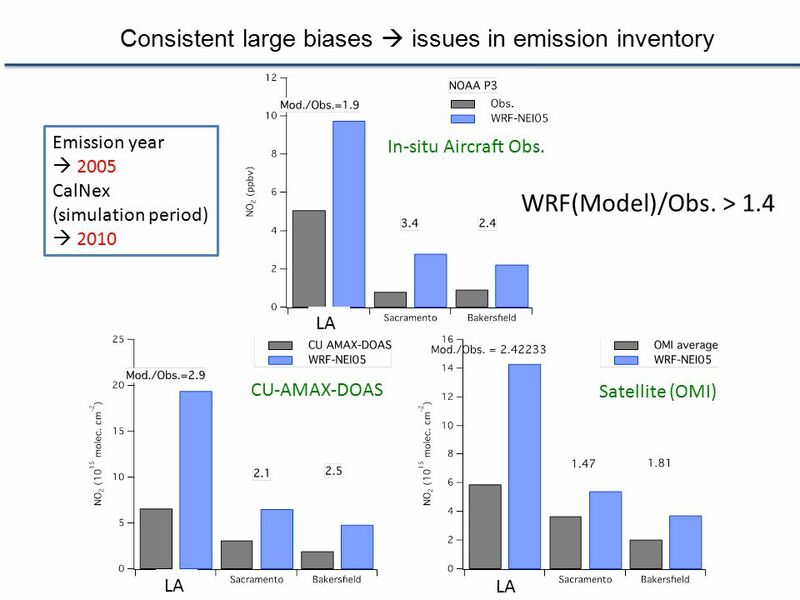 Emission inventory also affects the satellite retrieval. 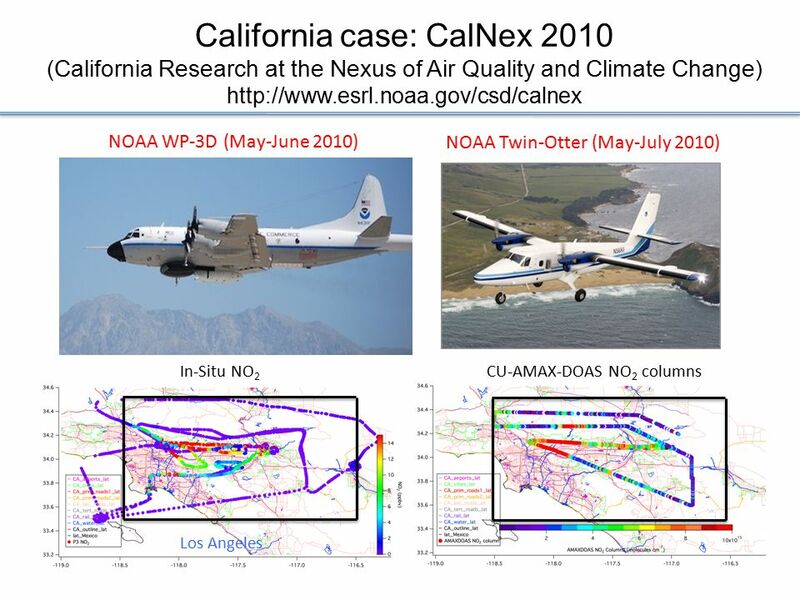 Download ppt "Evaluation of NOx emission inventories in California using multi-satellite data sets, AMAX-DOAS, in-situ airborne measurements, and regional model simulations." Lok Lamsal, Randall Martin, Aaron van Donkelaar Folkert Boersma, Ruud Dirksen (KNMI) Edward Celarier, Eric Bucsela, James Gleason (NASA) E.S. 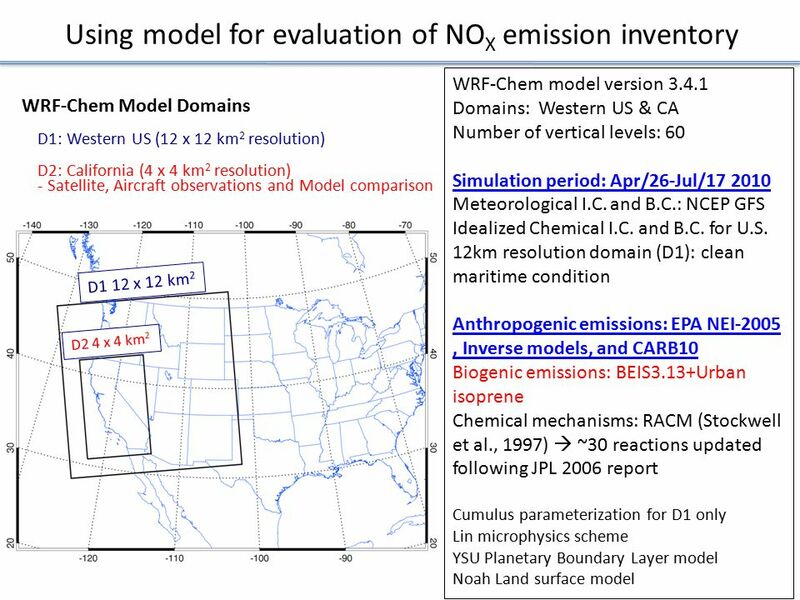 Evaluation of Satellite NO 2 Columns over U. S. Power Plants using a Regional Atmospheric Chemistry Model Si-Wan Kim ESRL, NOAA and CIRES, U. of Colorado. R. Ahmadov 1,2, S. McKeen 1,2, R. Bahreini 1,2, A. Middlebrook 2, J.A. deGouw 1,2, J.L. Jimenez 1,3, P.L. Hayes 1,3, A.L. Robinson 4, M. Trainer 2 1 Cooperative. CO budget and variability over the U.S. using the WRF-Chem regional model Anne Boynard, Gabriele Pfister, David Edwards National Center for Atmospheric. 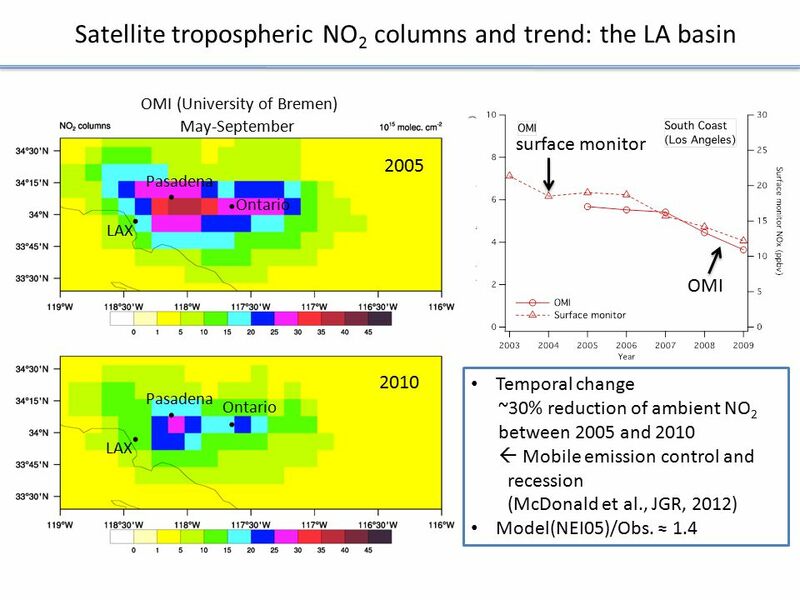 Improvement in modeled ozone source contributions via sequential assimilation of Aura satellite measurements into global and regional models Min Huang. 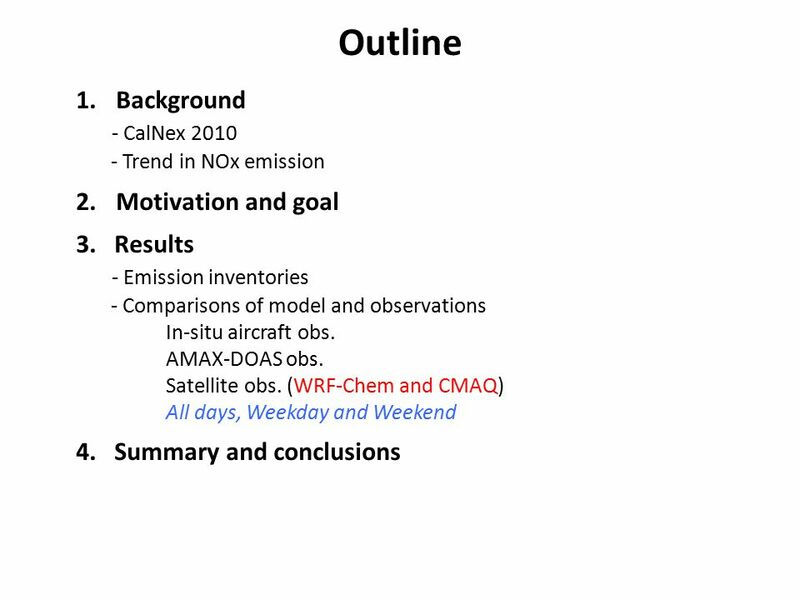 Improving the Representation of Atmospheric Chemistry in WRF William R. Stockwell Department of Chemistry Howard University. DC8 photo of Mexico City by Cameron McNaughton, University of Hawaii, Feb 2006 Characterizing Megacity Pollution and Its Regional Impact with TES Measurements. Satellite-based Global Estimate of Ground-level Fine Particulate Matter Concentrations Aaron van Donkelaar1, Randall Martin1,2, Lok Lamsal1, Chulkyu Lee1. 1 Surface nitrogen dioxide concentrations inferred from Ozone Monitoring Instrument (OMI) rd GEOS-Chem USERS ` MEETING, Harvard University. 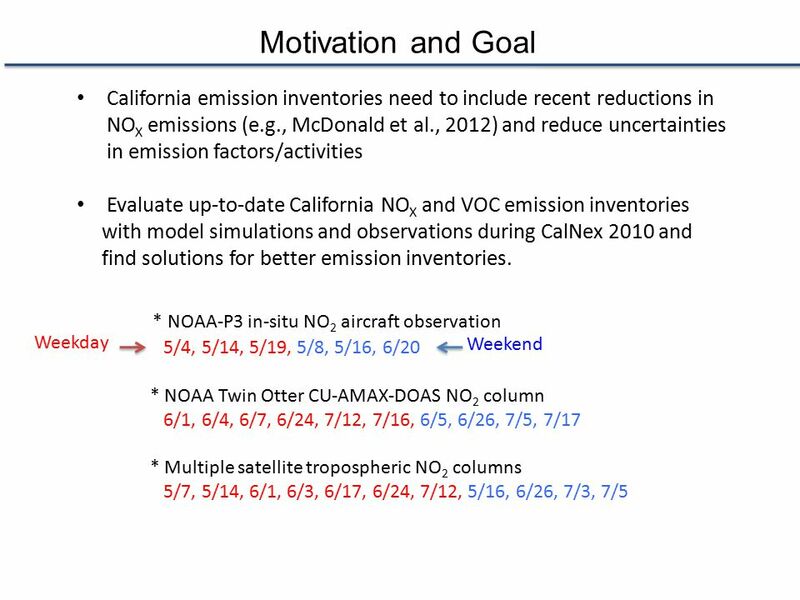 Objective: Work with the WRAP, CenSARA, CDPHE, BLM and EPA Region 8 to use satellite data to evaluate the Oil and Gas (O&G) modeled NOx emission inventories. (a)(b)(c) Simulation of upper troposphere CO 2 from two-dimensional and three-dimensional models Xun Jiang 1, Runlie Shia 2, Qinbin Li 1, Moustafa T Chahine. 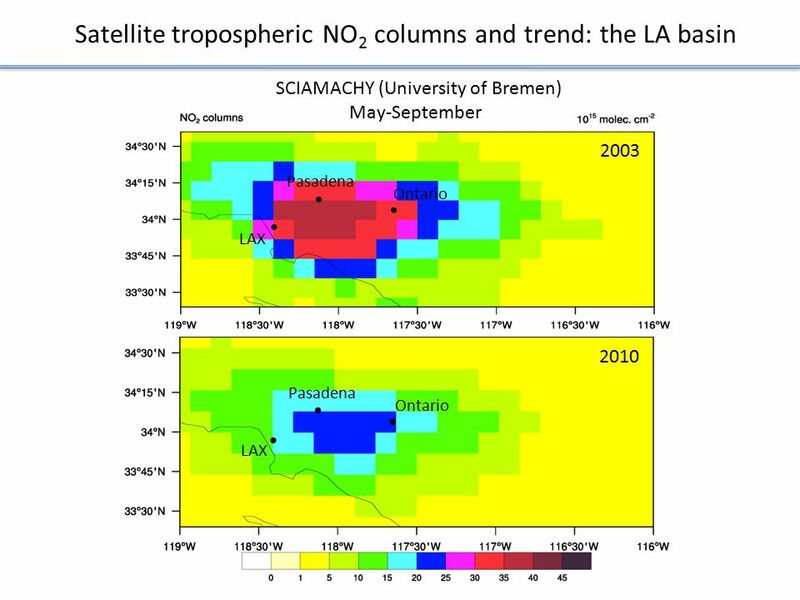 AQUA AURA The Berkeley High Spatial Resolution(BEHR) OMI NO2 Retrieval: Recent Trends in NO2 Ronald C. Cohen University of California, Berkeley $$ NASA. 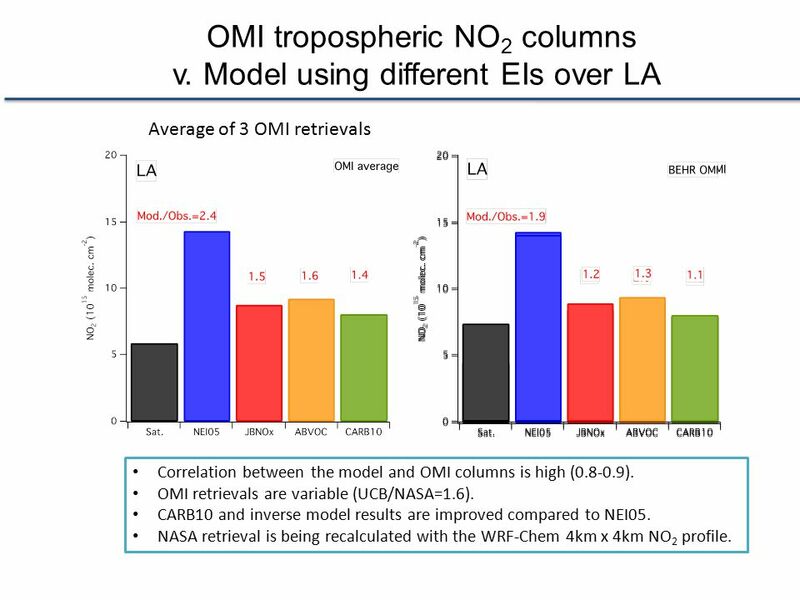 Indirect Validation of Tropospheric Nitrogen Dioxide Retrieved from the OMI Satellite Instrument: Insight into the Seasonal Variation of Nitrogen Oxides. Mapping Greenhouse Gas Emissions in the Los Angeles Basin by Remote Sensing Using a Fourier Transform Spectrometer on Mt. Wilson Kam Weng (Clare) Wong. TEMPO NO 2 Validation Ron Cohen, UC Berkeley. 1. Precision of 1x10 15 molecules/cm 2 (~0.5 ppb in the PBL) Approach: ~3 Pandoras for 1 month; 4 seasons.